Not all bees are alike, even while they buzz through our ears in the height of the Spring season. There are so many bee types—they can pollinate every flower to pop up from the ground. Each kind of bee has an importance in the pollination of our vegetables and plants. Their characteristics also have a broad range from gentle buzzers to sharp stingers. It is essential to know which types of bees to avoid or have awareness of how to prevent an incident from occurring. We have bee identification charts for five of the most prominent bees you will encounter in Las Vegas. Avoid an unfortunate incident with the less gentle bee types by knowing what they look like and how to identify them. These busy little workers are found in your garden—or even inside of your home’s infrastructure. Bees are crucial helpers in pollinating our plants, fruits, and vegetables so it is vital we do not intrude on their pollination pattern. Think before you swat the buzzing bug or scare them away from getting their nectar. 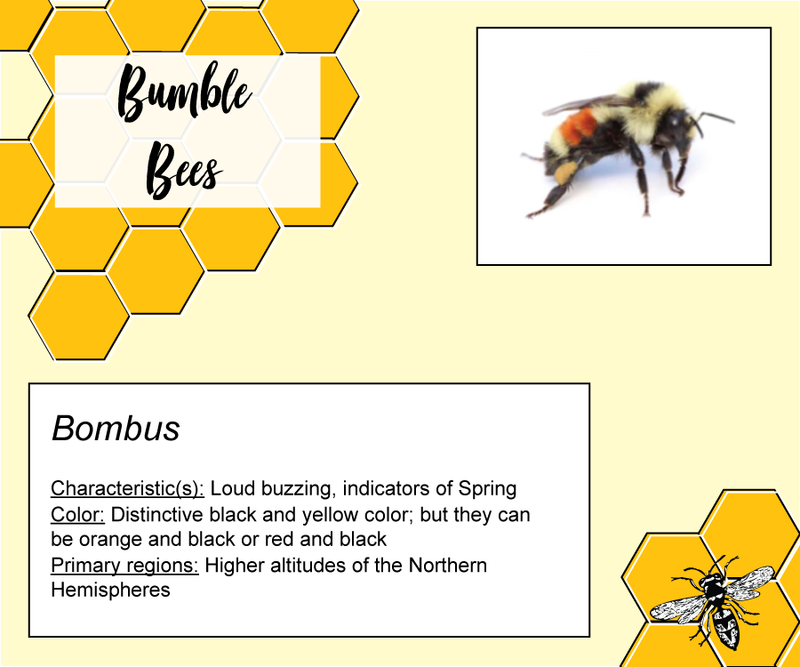 Also known as “killer bees”, this bee type is known for its defensive nature. They are a variation of the European bee who were cultivated to increase honey production, but this little bee only increased its aggression in the process. 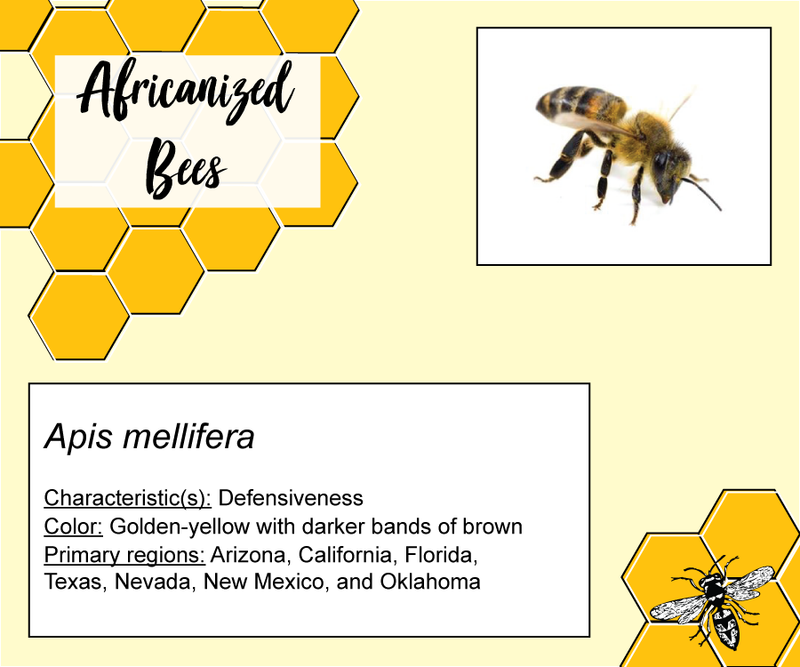 This bee type arrived in the United States throughout the 1990s and made their habitat in the southwestern United States. They are known for swarming in large hives and making their colonies inside of a home’s infrastructure, which creates a problem for the homeowners. They make their hives in the prime of the Spring season and they attack in large numbers. Africanized bees have ten times more of a sting than the standard bee, so you should avoid aggravating a hive by yourself. If you notice this little busy bee near your home, contact your local bee removal service so they can professionally remove them without disturbing them. They also prevent you from causing severe infrastructure damage. 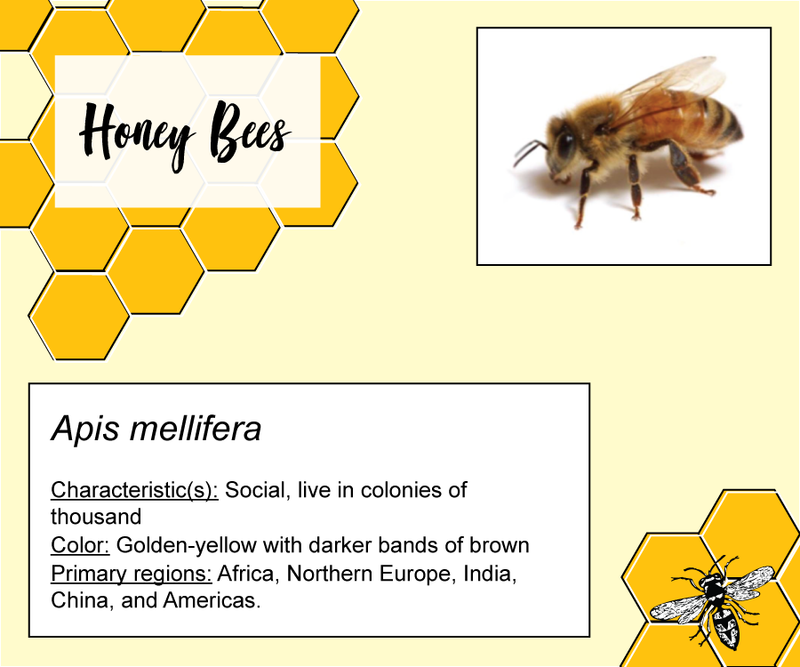 The main provider of the delicious sweetener we use for teas and buttery biscuits, the honey bee should be your favorite bee type. They may be bees, but they are known for being social butterflies. Honey bees enjoy going in a swarm and socializing while they provide us with the delicious sweet treat. The typical colony of a honey bee includes over 20,000 bees and one royal queen. A building of the hive and honey happens in the summer months. The male honey bees don’t have stingers, so you don’t need to worry about the revenge of agitating a little one. But you still shouldn’t cause a disturbance in their hive or path. Honey bees gather nectar from almost two million flowers to make just one pound of delicious honey. The average little worker makes only 1/12th of a teaspoon of honey in their entire lifespan. If you thought you were wasting your life at your job, imagine the life of the honey bees. The soundtrack to the Spring season is the sound of buzzing in the garden. Bumblebees are the responsible music makers of the outdoors. They have a loud buzzing noise which carries throughout your entire yard. Similar to honey bees, these little buzzers are very social and tend to hang out most of their time in their hive. Bumblebees are known for their queen hibernating in the winter, and their colonies die in the late fall. This bee type doesn’t produce any honey for your home, but they still help pollinate many vegetables and berries. You can thank these bees for berries, hothouse tomatoes, and peppers. This is one of the more endangered type of bees, so they are one of the bees to save, and we can do our part to help keep them from disappearing. You can help by providing them with pollen and nectar by planting flowers for them to stop by on. Avoid the use of pesticides in your garden to keep the chemicals from affecting the bees. The name of this bee type couldn’t be any more accurate, as they build their nests by tunneling into wood. 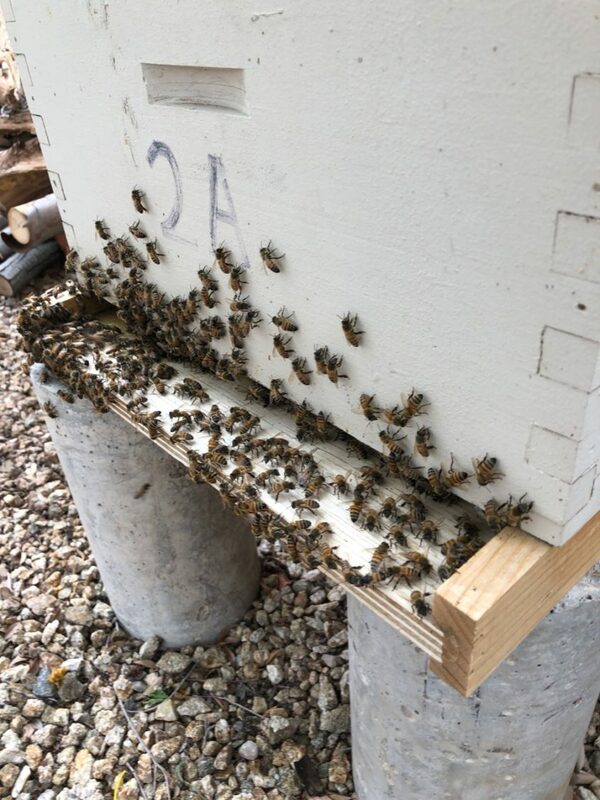 This nesting technique makes them destructive to any wood structures, so prevention of them using wood to create their hives will help you avoid an invasion. 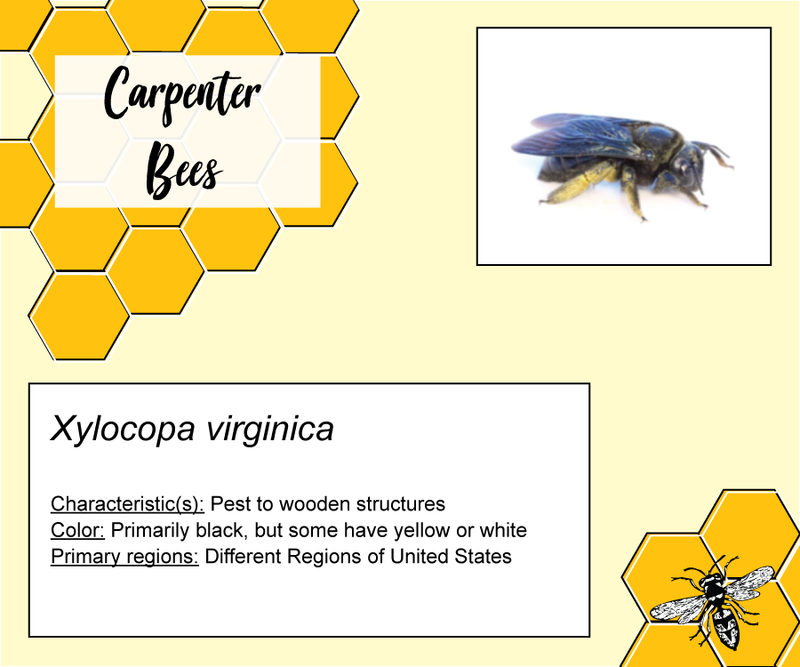 Keep weathered lumber on lockdown, as this is a primary reason these carpenter bees come to your home. They make their nests in the winter and sprout out in the Spring, but keeping them in the unfinished wood could continue to spread their hive and tunnels. They won’t be a threat to humans, but they do threaten wooden infrastructures. Carpenter bees will build their nest by drilling a perfect hole in the wood and begin to tunnel into it. This is another nest bee, who will tunnel into wood to build a hive. The only difference is this type of bee will also cut perfect circles out of leaves to add to the tunnels. Identifying leafcutter bees in the area happens when the leaves of your garden have perfect cutouts. It is fascinating to watch a leafcutter bee build its nest with all its perfect leave circles in the pit. They are extra valuable to farmers as they have an efficient pollination process for plants. 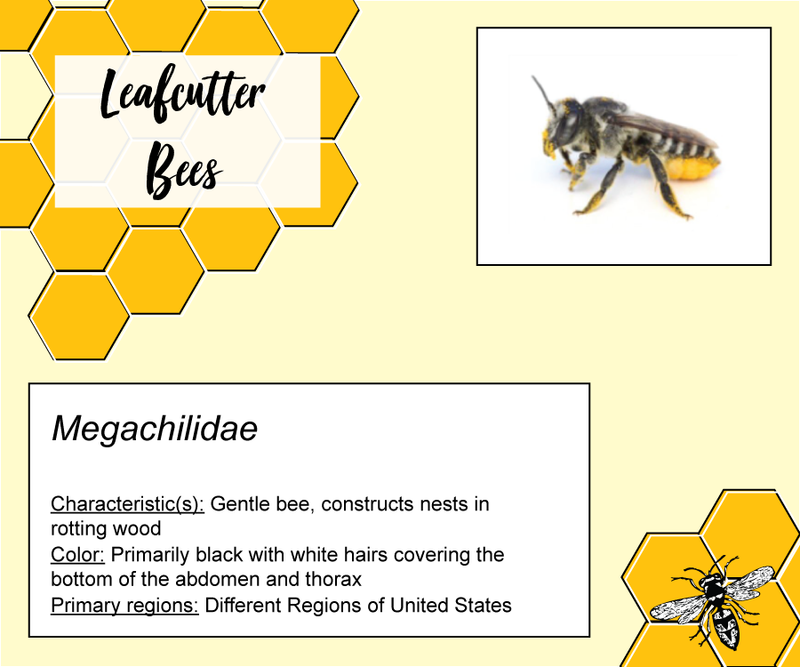 Leafcutter bees do the same amount of work as almost 20 honey bees, meaning 150 of them working in a greenhouse provides the same amount of pollination as nearly 3,000 honeybees. Leafcutter bees emerge from their little tunnels in the height of Spring and lay their larvae in the tunnel. They will then provide their babies with pollen to sustain them when they hatch and the larvae will mature over the winter to emerge in the following spring. Bee Masters have expertise in bee removal in Las Vegas and can remove an invasive hive without causing damage to the Africanized bees depending on the size and location of the hive. We will also re-construct any infrastructure damage the colony caused to your property. Contact us to have us remove a hive today!